Your best friend is the best listener in the whole world. You can scream, cry, complain, and your bestie just sits there quietly and takes it all in. He doesn’t give you advice you don’t want, he never changes the subject, and if you talk about guys you like or teachers you don’t, your secret is safe because your best friend would never share those things with anybody else, ever. In fact, your best friend doesn’t say a word. That’s because he’s a dog. But what would you do if he did start talking back? 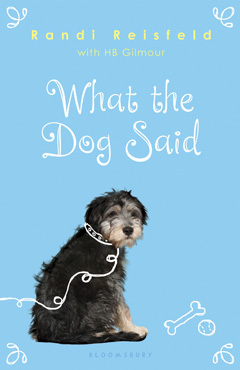 In the new book “What the Dog Said” by Randi Reisfeld (with HB Gilmour), a pooch learns to “Speak!” all too well. Grace Abernathy absolutely could not understand how her sister, Regan, had moved on so easily. Didn’t she care? It wasn’t all that long ago that Grace and Regan’s father was killed while leaving work. Grace remembered rushing to the hospital like it was practically last night. It still hurt so much. So why was Regan planning for a happy future without their dad? Grace didn’t know, but she was pretty sure that Regan’s latest hair-brained idea would end up badly. Sixteen-year-old Regan heard that training a service dog might help with college admissions, but Grace figured that her older sister wouldn’t follow through. She never did before. At the shelter, Regan liked the fluffy white Malti-poo. She wanted a purse puppy, and Grace didn’t much care. But when she heard a dirty, mangy pooch say, “Pick me,” Grace couldn’t believe her ears. Rex was his name and he was a scruffy mutt. His coat was wiry, his paws were huge, and his tail was like a baseball bat but he seemed to like Grace, even if she didn’t want him butting into her life. He only spoke to her (which made her doubt her sanity), he snored, and there were times when he just wouldn’t stop yakking. Still, his hearing was good, which came in handy when spying on others. But training a service dog means that you have to let him go eventually, which was another loss Grace could barely stand to think about. She needed Rex to stick around. She was starting to like what the furball had to say. There’s no way around it: “What the Dog Said” is awfully darn cute. Author Randi Reisfeld gives young readers with pets what they want: a dog that actually talks back, without anybody having to pretend that he does. I loved Rex; he made me laugh, but the real appeal is his relationship with the vulnerable heroine of this book, 13-year-old Grace. The sweet and grief-stricken young character will steal your heart as she both warms it, and breaks it in two. If the same old summer reading fare makes you want to flea, then here’s a book you’ll need to collar. For 12- to 18-year-old dog lovers and teens who crave a good story, “What the Dog Said” is something to fetch.